Harvard geneticist George Church shows off the DNA sequence of a colleague. In the future, genetically modified organisms could be making our medicines, our fuel, our housewares, our houses — and they could even help us remake ourselves. All that may sound like science-fiction, but the future is already arriving, in the form of the bioplastic bottle you may be holding in your hand. Harvard geneticist George Church lays it all out in a new book, "Regenesis: How Synthetic Biology Will Reinvent Nature and Ourselves," written with Ed Regis. "We are already remaking ourselves and our world, retracing the steps of the original synthesis — redesigning, recoding and reinventing nature itself in the process," they write. If you want to talk about far-out, how about regenerating extinct species, ranging from woolly mammoths to Neanderthals? How about synthetic methods for photosynthesis, the process that turns carbon dioxide, water and sunlight into oxygen and fuel? How about tweaking the human genome to make ourselves immune to multiple viruses? Heck, why not make ourselves virtually immortal? "Regenesis: How Synthetic Biology Will Reinvent Nature and Ourselves" is written by Harvard geneticist George Church and science writer Ed Regis. Cosmic Log: You’re setting forth quite a hopeful, positive vision in "Regenesis." The way you see it, the application of genetic engineering could get us to the transhumanist age. Are you trying to cast a positive vision as an inspirational goal, or do you feel that this is the realistic way that things will develop? George Church: Well, it’s not entirely positive. I do describe potential pitfalls. But I feel that most of those pitfalls have solutions as well. It’s positive in the sense that I feel a number of things that often seem like impasses have win-win solutions if you dig deeply enough. The book is not intended to be inspirational, although I think some people will find it to be so. It’s really intended to have some realism. For some of the points, it’s hard to say when they will arrive. Q: In some of the areas you discuss, that future has already arrived. For example, you talk about how genetically engineered microbes are being used to turn plant products into plastics. People looking at their water bottles are probably seeing the first evidence of the revolution you describe, but what other innovations are just over the horizon? A: There are some things that are happening in real time. For example, Joule Unlimited, one of the companies mentioned in the book, just announced a deal with Audi to produce biofuel. Biofuels Digest said this looks like the largest-scale and most realistic and near-term biofuel. The expected price is quoted at $1.28 a gallon. That’s converting carbon dioxide and sunlight into fuel. Other companies are working on similar processes, using the same bacteria, to produce food and other chemicals like plastics. Many other things in the book are further off, but those are examples of things that are quite close. Multi-virus resistance is somewhere in between. We’ll see some progress on getting that out of laboratories and into industrial processes in the next couple of years. Q: Over the past year, the Wilson Center has talked about the concerns relating to synthetic biology, and how there should be more regulation of the field. Where do you come down on that issue? A: Well before the Wilson Center became involved, I was one of the primary advocates for more regulation. This is probably not the attitude of most of my colleagues who are being regulated. My own lab is being regulated as well. I think that there are some areas where regulation could be a big burden, but generally speaking, I find it to be quite positive. With the Food and Drug Administration, for example, I see a lot of things that still slip through. And most of the things that they block are just tiny increments. Most of the money that’s being spent is just to extend patents, or extend a monopoly that’s based on drug patents. I have similar feelings about the EPA. What I was mainly asking for, in the early 2000s, was just licensing and surveillance. Everybody who practices synthetic biology should be licensed, including amateurs. Same as cars, right? You’re an amateur car driver, you get a license. Then you don’t assume that just because drivers have licenses, they’re going to behave themselves. You watch the roads, and do radar monitoring to catch speeders. There should be a similar arrangement for synthetic biology, where the stakes are higher. As far as I know, nobody has ever died because of synthetic biology, while one million people die every year in automotive-related accidents. But I still think the stakes are quite high for synthetic biology. A: Actually, in a way, I helped start that. The public should be more engaged in science, so that’s a healthy part of it. Do-it-yourself biology has not only synthetic components, but also analytic components. I would put more emphasis on studying your own genome than on synthesizing new ones. But anything that gets people engaged in science so they can make educated political and economic decisions is important. Right now we're making an awful lot of economically important decisions on technology that our leaders don’t understand, and even their staff doesn't understand. 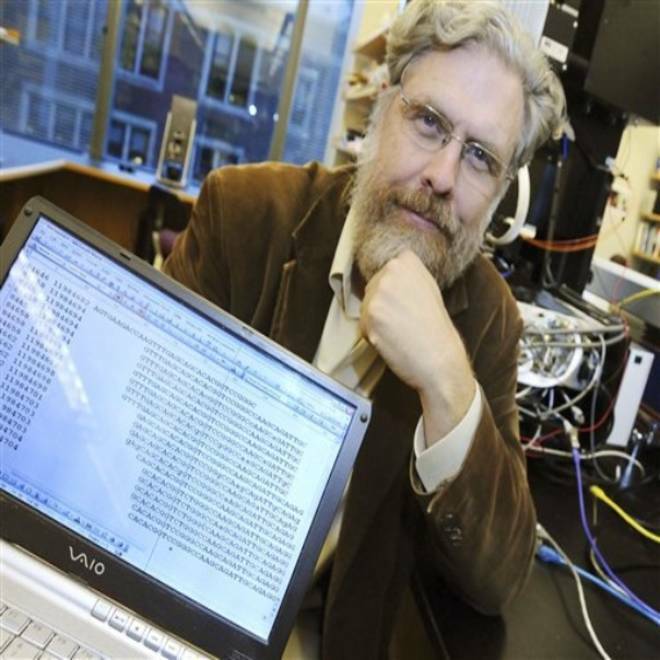 "Genome: The Future Is Now" profiles Harvard's George Church. Q: If you had five minutes with political leaders – at the White House, or in Congress – what’s the one thing that would you want them to understand better about synthetic biology? A: They’re actually doing a fairly good job. They correctly perceive that this is the era of the bio-economy. ... I think there is a tendency to give in to lobbies. For example, even though many, many experts felt that going from corn to ethanol was a bad idea economically and scientifically, they still gave in to it. Now, during a drought year, they should be able to back away from that. But the corn lobby is powerful. The policymakers understand that the bio-economy is on the rise. There’s almost nothing that we can’t make better and cheaper using biotechnology, including computers and all sorts of consumer goods and chemicals. But the details matter. I guess that’s what I’d use my five minutes for. It’s not sufficient to identify a major new thrust. It’s how you do it. There need to be more technical people in positions of power, and the people who are in power need to spend more time on the technical issues. Q: Getting back to that issue of vision vs. reality, there’s been a lot of talk over the past few years about how the genomic revolution was oversold, and how applying the findings relating to the human genome has been harder than people thought. At the same time, we’re hearing about studies to nail down the genetic roots of all sorts of traits relating to wellness and illness. You’re involved in some of those studies. Do you feel as if the promise was there, and it just has taken longer than expected for the revolution to kick in? Or do you feel as if there was something that researchers missed in the first years of that revolution, which really needed to be present in order for the revolution to take off? A: I don’t recall what was promised by whom. I certainly did not promise a particular time line for delivery of a particular amount of value to society. Battelle issued a report on the genome revolution, and claimed that there has already been a 140-fold return on investment – something around $700 billion. You’ll have to draw your own conclusions about that report. That was issued in 2011, so it was within a few years of when we said we were going to finish the project. When you get 140-to-1 return on your investment within just a few years, that strikes me as better than your average government decision-making process. A lot of people have the misperception that the human genome sequence was complete in 2001, which was five years ahead of schedule, but it is still not complete. At least 2001 was the end of the "race," so to speak, so we then got serious about dropping the cost. The cost has dropped by a millionfold since then. You don’t get that in any other industry. If we had followed Moore’s Law, the prediction of an affordable human genome would have been in 2040. Actually, we have an affordable genome, by many people’s standards, today. That gets us to a second misperception: People think either that we don’t have an affordable genome, or that the genome we have is not useful. I would maintain that there’s not a person on the planet who’s getting standard medical care, who shouldn’t get their genome sequenced. It may be that for quite a few of those people, the genome would come back and say, “You’re pretty healthy. You’ll die eventually, but we don’t know what you’ll die of.” That will be the report for many people. But you don’t know if you’re one of those people in advance. You don’t know if you’re going to have a fire or have a car accident before you get fire or accident insurance. But you do it anyway, just because the consequences of not having insurance could be catastrophic to the economy of your family. Similarly, the consequences of getting one of these diseases, which can be influenced by your genes, is catastrophic to your family. So why take the risk? It’s only $4,000, after all. I think it’s come down to the point where the quality is high, the cost is low, and the interpretability is high. Not for everything, but for some medical issues. I can’t think of a reason why someone with decent health care and income shouldn’t be sequenced today. Q: There’s been a lot of talk about the $1,000 genome as a crucial price point, and you mentioned $4,000. Considering how far it’s come, from billions of dollars, how do you expect the price curve to develop over the next year, two years or five years? A: I was one of the people who promoted, as a goal, the $1,000 to $10,000 genome. I wasn’t specific on where in that range it should be, but it should be something that’s affordable over a lifetime. People locked into the $1,000 number, which I don’t think is the best number, but anyway … I think what will happen is that it’ll plateau somewhere around where it is right now, and the quality of interpretation will continue to improve. That’s similar to the experience we had when computers came out of the stratosphere and the cost fell to thousands of dollars. People still buy computers for thousands of dollars; they’re just way, way better. But $1,000 is definitely attractive both for a computer and a genome. The difference is, you throw away your computer after three or four years. The genome, you keep for 80 years or however long you’ve got left. So I think within the next year or two, the cost will probably stay at $4,000, but you’ll get better quality of interpretation, better software. There are some technologies over the horizon that may bring the price down to hundreds of dollars over the next two to five years. I know they’re coming. But this is one of those places where there’s enough of a pause in this breathtaking curve that it’s a good time to think seriously about it. It’s just like whenever the latest iPhone or Android comes out, that’s when you want to make the decision – rather than waiting forever, because everything keeps improving. Q: Do you think we’ll see all sorts of products on the market for genome analysis, like iPhone vs. Android vs. Nokia vs. iTouch? Will there have to be a lot of consumer education about the various products? A: Having the choices we have now for computers and cellphones is a wonderful problem to have. I think there will be multiple genomic products as well. But the main reason for consumer education is not necessarily deciding which method you want. Right now, the highest-quality genome available, which I think is ready for clinical applications, is from Complete Genomics. People will need "Consumer Reports" types of independent comparative assessments, so they can judge this for themselves. But even more important, they need to be educated about the benefits and risks of looking at particular parts of the genome, so they get educated in advance about what they’re looking for. The more powerful the technology, the more important it is to have that kind of education, and to have licensing and surveillance as well. Q: So, other than reading “Regenesis,” what would you suggest that we do to get educated? A: Specifically for personal genomics, there is an organization called pgEd.org that’s focusing on educating the public, including high schools. There’s another popular book called “Here Is a Human Being,” by Misha Angrist, which is fun for getting an anecdotal description. To some extent, the best thing to do is to jump in and get your genome done. You could start with one of the cheaper services, but the problem is if you start with a cheap service and you don’t actually learn anything, you might not go on. People will figure it out. There will be an increasing number of Web resources to lead you through this. Genes in your email? Why not? What should be done about synthetic life?